Montana House is hosting independent wildlife consultant, Brian Peck, who will speak about Grizzly Bear population recovery in the northern Rockies. 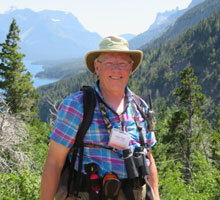 His presentation begins at 4:00 PM in the Kintla Camp room at Montana House in Apgar Village. When Lewis and Clark traveled up the Missouri River in 1804-06, there were an estimated 50,000 grizzlies in the lower 48 states. Today, there are just 1800, occupying six, largely isolated Recovery Areas and approximately two percent of their historic range. The U.S. Fish and Wildlife Service contends that grizzly populations in Greater Yellowstone Ecosystem (700) and the Northern Continental Divide Ecosystem (1000) are “recovered”, and can be removed from Endangered Species Act (ESA) protection. Most of the environmental community and independent scientists disagree, and are concerned that a premature ESA delisting will give away all the gains of the last 40+ years. Brian’s program will take a comprehensive and enlightening view of where we’ve been with grizzlies in America, where we are now, and how we can achieve real and lasting grizzly bear recovery based on sound ecological principles.